Last week was a very eye-opening week for me as a death care professional. I participated in the ICCFA’s (International Cemetery Cremation Funeral Association) annual educational convention, where I taught a class and listened to others. Most of the sessions discussed how create a more meaningful “Celebration of Life” (funeral) service for families who select your funeral home. The convention floor consisted of hundreds of suppliers whose products ranged from state of the art memorialization concepts that were hip and unique to those more traditional items such as caskets, vaults and urns. Architects, interior decorators, landscaping designers, and even furniture companies were displaying their merchandise, expertise and recommendations on how to create a warm feeling when people walked into our facility. Upon return of the convention, I received two phone calls. The first was from a close friend whose sister’s husband suffered a massive heart attack on the golf course and died. The second was from another close friend whose husband died from complications after heart surgery. Both men were in their mid-sixties, both deaths were unexpected. The next few paragraphs are the conversations that took place. The gentleman who died playing golf lived in Las Vegas. He and his wife were enjoying a round with another couple when this all took place. 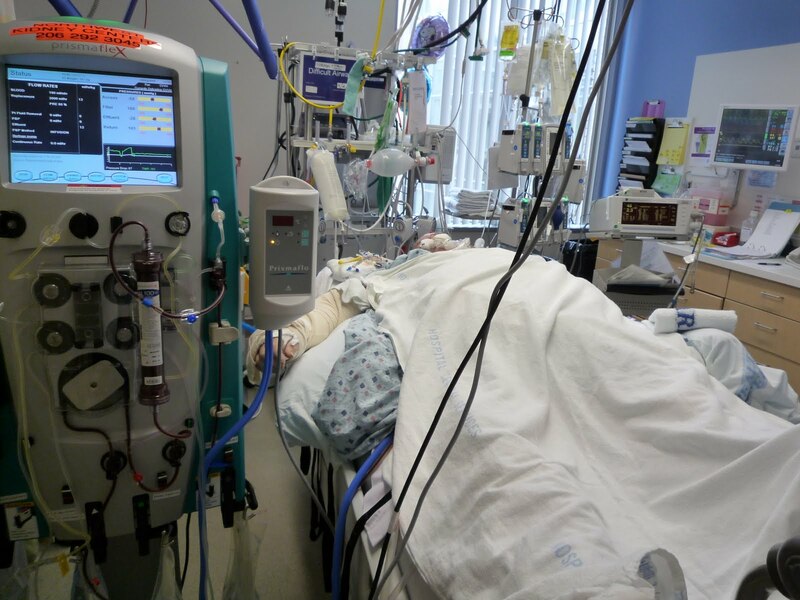 They made it to the hospital where ultimately they placed him on life support and instructed his wife to start calling family members. They kept him alive long enough for his adult children to fly in and be by his side when he died. His wife requested an immediate cremation and said there would be no services. He was a veteran so she made the decision to place him in a national cemetery. All these decisions were made while she was sitting in the hospital. The cremation provider (notice I did not say funeral home) was made primarily on price. She was adamant about there would be no discussion about a service. Her husband of 20 years would be cremated and within 30 days laid to rest at national cemetery with full military honors. No service for friends or family. For those of you who don’t know – when a person is buried in a national cemetery, the time and date is typically dictated by the cemetery. From hello to goodbye, the service is approximately twenty minutes. 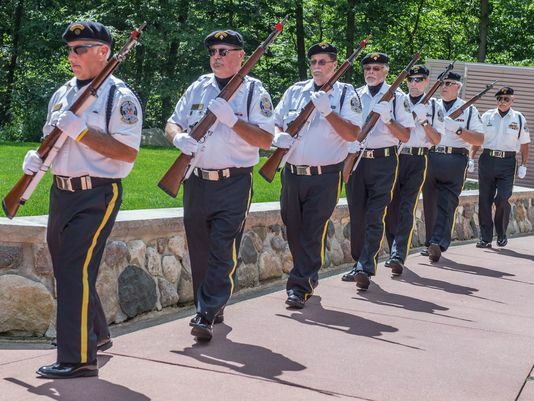 It’s conducted by active duty consisting of strict ritual where a few words are said, a flag is presented, there is a 21-gun salute and taps are played. Family members present are escorted out quickly and the military is off to the next funeral. There is no time or room for customization. The second gentleman was also a veteran. What makes this unique is that for many years he worked in an emergency room where he comforted others, then made a career decisions to work at a crematory and funeral home. He was a part of the care team that brought other family’s’ loved ones when death happened into the funeral home’s care. He also was a trained cremation expert who operated the cremation machine. Bottom line – he touched many people’s hearts and died way too soon. Unlike the first individual above, he had a pre-planned funeral. He elected a direct cremation with no funeral. He wanted no fuss made. His family, however wanted to honor his wishes but needed something else. 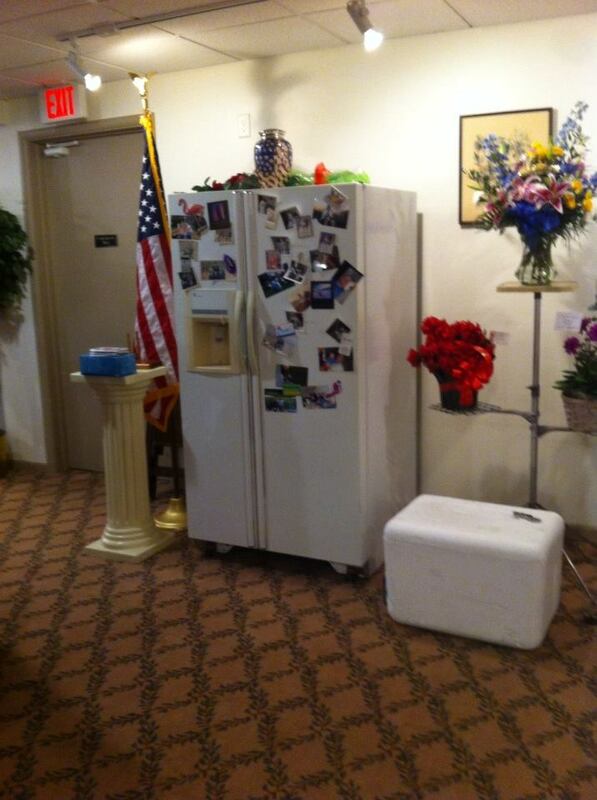 In the end, they made the decision to have a simple gathering at the funeral home complete with proper beverages and all his favorite foods unconventionally placed in a refrigerator that was moved into the family center. By doing this, they were able to honor his wishes of a direct cremation with no “fuss” meaning formality and get what both their family and circle of friends needed, closure in a relaxed family style setting! Why am I writing about these two very similar but different deaths? Because in each situation both the individuals prior to their death had shared that they want a direct cremation and their next of kin honored that. In the first story, outside of the person’s wife from a second marriage and his two adult children, no one got to say good-bye. Not his grandchildren, cousins, friends, co-workers or even mother of his children. Yes, the three people that mattered most were there when life support was turned off, therefore they witnessed him slip away, but what about everyone one else? Did his life not mean anything to anyone else? Does the surviving spouse not realize that by doing nothing each time she goes to the store or on a vacation and runs into people she knows and they ask “Where is ____? Or How _______ doing,” she is going to have to retell this story over and over. I simply don’t understand this. Help me to understand how a person can live over six decades, serve our country, be a son, brother, husband, father, grandfather and friend to so many, where their entire life’s meaning is reduced to 6-8 pounds of cremated remains, placed in a box for safe keeping and buried without honoring the life that was lived? Doesn’t anyone stop to realize that the act of doing nothing, is ultimately very selfish? It’s only natural for people to want to gather together in times of joy and sorrow. By doing nothing, and enabling that wish, sends a message to those left behind that not only did their life not matter, the feelings that those who did love and care for that person don’t matter. Unless it’s purely financial, it’s a lose – lose situation. Even, when finances are at a minimum, there are ways to honor one’s life. For those you reading who have a child, I ask you – if your child died, would you choose to do nothing and have a direct cremation, or would you within your financial means have some form of a service that celebrated the life lived? 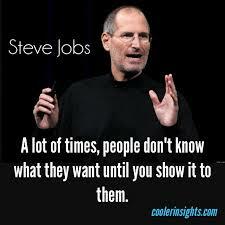 In all candor, what do you say to people who don’t want your services, even if you know it’s what they need? I really would love to hear your thoughts. this is a topic in our marriage since my husband has terminal cancer. He has never wanted to be cremated, wanting the traditional service and burial. I was ok with that until he became ill and I was faced with the prospect of burying him far too soon. We still have 3 children at home. I told him that I would like to do all that he wishes, but in the end, after the funeral, I would want him cremated since I can’t bury him in the ground. He does like the urn we have considered- an hourglass to symbolize redeeming the time and eternal life. Hopefully, we will have more time to decide. I think he is resigning himself to the fact that funerals are for the living, and that my plan isn’t so bad. In the meantime, I have told him if he doesn’t want to be cremated, he’d better keep living. He chuckles at that. In my family funerals are a big deal. My father’s funeral was huge with several hundred people in attendance. My mother has her funeral plans finished and paid for. If I had a child, and God forbid, lost him, there would absolutely be a service. For me personally, I want to be cremated and I’d prefer things to be low key. Just my preference. As for your other question…If someone doesn’t want my services, I don’t assume that I know what they need. One thing I know about death and loss is that everyone processes it differently. So not everyone needs a particular type of service. Or any service at all. A funeral can be an overwhelming experience and not everyone wants to go through the whole production. Then there are those who don’t agree with standard funeral practices, even if they can afford it. Maybe they have another way planned to honor their loved ones life. In the first case you shared, I wonder what this woman and her husband may have discussed about his funeral plans. Maybe she knew he wouldn’t have wanted a funeral. Maybe it was his wish to be buried at the national cemetery. Maybe they had a horrible marriage, she was grateful for it to be over and wanted him put behind her as soon as possible. It happens. Or maybe she was going to plan a separate celebration of his life later on. A body isn’t necessary for people to gather, support each other, and share memories of a loved one that’s passed on. A funeral / memorial / celebration can happen at any time. There’s no schedule that has to be kept. My overall point is that I don’t believe you can know for sure what a person needs in a situation like this. You best serve the grieving by offering your services, and simply respecting and honoring their decisions without judging them. Especially at a time like this. Tamara- Thank you for your response! I so much appreciate, respect and love your feedback. It’s such a delicate subject and all so very personal – you are correct.